Ecamm Network on Friday introduced its BT-1 Bluetooth wireless Web cam, which it calls the world's first such device. Designed for Mac compatibility, the BT-1 will cost $149.99 when it ships in March. Ecamm plans to show the Web cam at Macworld Expo in San Francisco next week. The BT-1 streams H.264-encoded video at 640-by-480-pixel resolution, and AAC-encoded audio at 48 kHz. 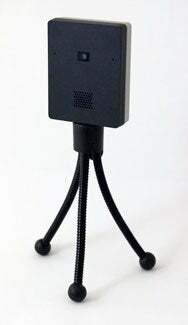 It measures 2 inches by 2 1/2 inches by 5/8 inches, and sports a standard tripod mount. The device works with iChat, Skype, and other applications, according to Ecamm. The BT-1 includes a flexible mini-tripod, which gives you the ability to adjust camera position, pan, and tilt, along with a USB cable for recharging its battery. The Web cam requires OS X 10.5 Leopard or later and Bluetooth 2.0+EDR or better.